Kickboxing promotions Glory 42 Paris and Glory 42 Super Fight Series are held on June 10. Glory World Series return to French capital. The organization has held its 28th kickboxing gala last March. 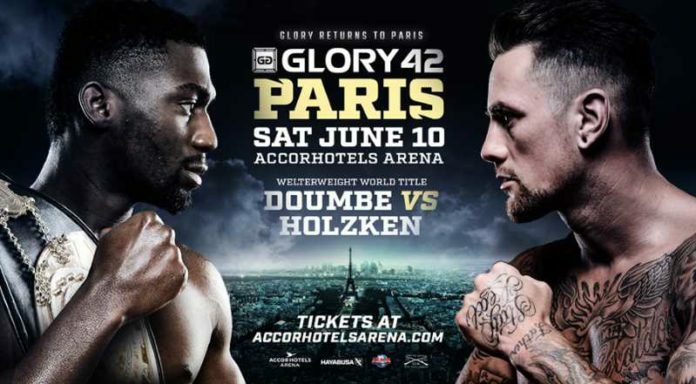 In the upcoming Glory 42 Paris the current welterweight champion Cedric Doumbe (66-4-1, 39 KO) of France faces off Nieky Holzken (90-12, 46 KO) of the Netherlands in the defense of the title. The bout is also a rematch. Doumbe earned the title against Holzken last December in Germany. In March he defended the belt against Yoann Kongolo in Belgium. He current rides the 11-fight winning streak. Holzken is No.2 ranked competitor in the division. He most recent bout was against Doumbe. In the upcoming bout he anticipates to square the differences taking the revenge. Glory 42 Paris fight card is current in makes. It is expected to feature a four-man lightweight tournament with the eventual winner to face off against the current champion Sitthichai. The program of Glory 42 Super Fight Series includes Yoann Kongolo (64-9, 46 KO) of Switzerland is going up against Antoine Pinto (132-36-1, 77 KO) of France. Also Jimmy Vienot (56-12, 27 KO) of France is fighting Casey “Greene (5-7, 2 KO) of the US. In addition, Nicolas Wamba, Zinedine Hameur-Lain and Dylan Salvador feature on the card. We will have more information as soon as it becomes available. The next event of Glory World Series is held on Saturday April 29. Jason Wilnis vs Simon Marcus for the middleweight title headlines Glory 40 Copenhagen. The organization has also scheduled the following promotion on May 20 in Den Bosch. Hesdy Gerges vs Chi Lewis-Parry headlines Glory 41: Holland.